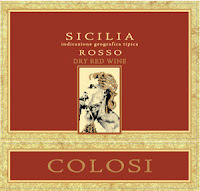 Made from 100% Nero D`Avola this little gem was one of my favorite wines at a recent tasting I attended. The nose consisted of aromas of black licorice, black currant, tar, tea leaf, and tobacco, which all developed into a fantastic and very complex bouquet while in the glass. Soft and ripe flavors of cherry, plum, and sweet tobacco followed into a nice smooth finish. For a relatively large production wine from Sicily, this was perhaps the hidden gem of the night and a wine I was very impressed with. I score it 91 points and give it a strong recommendation from a QPR standpoint.